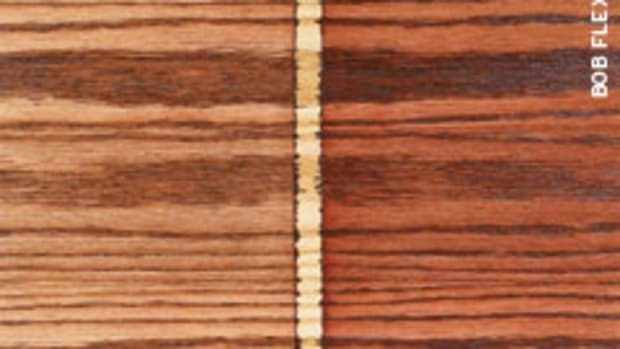 Blotching, which is the stain causing an uneven coloring on the wood, is usually associated with the wood rather than the way a stain is applied. Most tight-grained woods, especially softwoods, have a natural tendency to blotch. Blotching can also be caused by the way a stain is applied. The basic rule for getting an even coloring is to apply a wet coat of stain everywhere and wipe off the excess before it dries. If the wood doesn’t have a natural tendency to blotch, you’ll always get an even coloring. But two common stains dry so fast that it’s often difficult to get the excess wiped off quickly enough, especially in hot temperatures and on large objects. These are lacquer and water-based stains. Lacquer stains are usually available only to professionals. You can identify these stains by their strong, pungent odor and by the listed ingredients, which usually include acetone and maybe toluene or xylene. Water-based stains are easy to identify by the name on the can or by the instruction to use water for cleanup. When applying one of these stains, it will help if you can divide a large project into smaller parts. It will also help to wipe or spray the stain rather than brush it. Brushing is very slow. You could still have a problem, however, getting all the excess removed before the stain begins drying. To overcome this problem, get a second person to help you with one wiping or spraying the stain, while the other wipes off the excess. You aren’t limited to the sheens of finishes available from your supplier, which are often just gloss and satin. You can make any sheen you want from just one can of satin finish. First, let the flatting agent (the stuff you have to stir into suspension before use) settle to the bottom of the can. The easy way to do this is to keep the can from being shaken when you buy it. Otherwise, let the can sit undisturbed on a shelf for a week or two. Then pour off some of the gloss finish at the top of the can into another container. Now you have two sheens: one gloss and one very flat. You can mix these to get any sheen you want. You’ll have to experiment a little, because you don’t know the sheen of the mix until the finish has dried. On large projects, keep good records so you can maintain consistency. Keep in mind that it’s the last coat of finish you apply that is most responsible for determining the sheen. So if the sheen of one coat is too glossy or flat, you can change it with the next. It’s very important to soften all machined edges before applying any film-building finish. The finish will peel away from sharp edges (as shown in the picture) if they aren’t rounded over a little. You can easily remove the sharpness from edges with several light passes using medium-grit sandpaper. Especially when spraying finishes, it’s common to get too little finish on the edges of cabinet doors and drawers. If these doors and drawers are installed under a sink in a kitchen or bathroom, splashed water will break through the thin finish, causing it to peel. There’s rarely anything you can do to fix this damage short of stripping and refinishing so it’s important to get enough finish on the edges from the start. The most common method of spraying doors and drawer fronts is to lay them horizontal and spray from above. Typically, the edges are sprayed at a 45-degree angle. This doesn’t get enough finish on the edges. The first pass on the edge should be made all the way around at a 90-degree angle to the flat, horizontal surface. Then another pass at 45 degrees should be made to hit the routed or shaped edges well. Finally, apply full passes perpendicular to the top surface. Do this with each coat. There’s almost always a little dust that settles onto the last coat of finish before it dries, even with fast-drying finishes. As long as the dust isn’t excessive and as long as the particles aren’t large, you can make the surface feel smooth by rubbing with a folded brown paper bag. Give the finish a couple of days to cure so you don’t scratch it. You’ll be amazed at how well the brown paper bag trick works. It doesn’t remove the dust; it just levels it so you don’t feel the tiny bumps anymore. Silicon and silicone are not the same thing and the terms are often used inaccurately. So it’s worth explaining the difference. Simply put, silicon is sand and silicone (rhymes with “shown”) is an oil or gel that is used in furniture polishes, caulk and breast implants. Silicone is made from silicon, but is clearly very different. It’s Silicon Valley, not Silicone Valley as it’s often called. It’s silicon-carbide sandpaper, not silicone-carbide sandpaper. I’m not a professional photographer, but I’ve been photographing my own work for articles and books since 2004 when I bought my first digital camera. Other than arranging the object or objects you’re photographing in an attractive manner, the most important requirement for achieving good photographs is getting the camera adjusted to the ambient light. Using the flash rarely produces good results. The trick is to use a gray card, available from any professional photography supplier. This is typically an 8” x 10” cardboard made to reflect 18 percent of the light hitting it. It is gray in color (accounting for its name). With any consumer or prosumer digital camera, set the white balance to “custom” and fill the frame with the gray card leaning up against the object you’re photographing. (You will probably have to zoom the lens.) Follow the instructions for the camera to evaluate the white balance. This is a lot easier and usually more accurate than selecting one of the pre-sets for incandescent, cool-white fluorescent, sunlight, cloudy, etc. when you most likely have a mixture of these. For example, you may have daylight streaming in the windows of your shop, blending with cool-white fluorescents. Setting the white balance for the gray card adjusts the camera for accurate colors under any light. If you want to improve the quality still more, you’ll need to learn to use lights to create shadows. Succeeding will take a lot of practice and be expensive. Try just the white balance first and see if this trick doesn’t give you adequate results.